Definition at line 788 of file llpanelgrouplandmoney.cpp. Definition at line 824 of file llpanelgrouplandmoney.cpp. 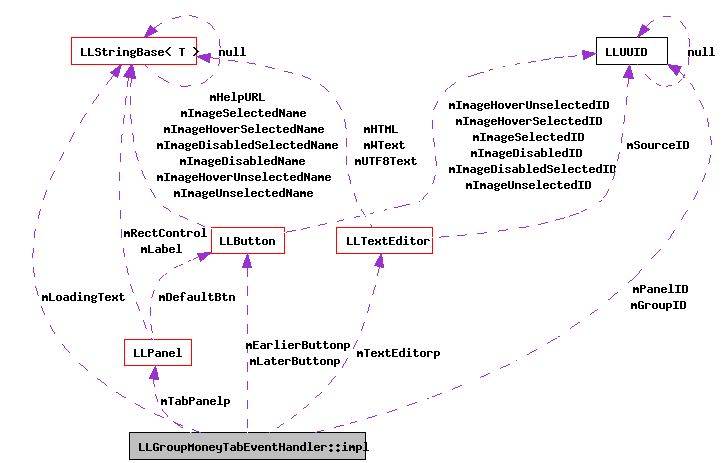 References LLUUID::generate(), mCurrentInterval, mEarlierButtonp, mGroupID, mIntervalLength, mLaterButtonp, mLoadingText, mMaxInterval, mPanelID, mTabPanelp, and mTextEditorp. Definition at line 848 of file llpanelgrouplandmoney.cpp. Definition at line 852 of file llpanelgrouplandmoney.cpp. Definition at line 857 of file llpanelgrouplandmoney.cpp. Definition at line 862 of file llpanelgrouplandmoney.cpp. References getCanClickEarlier(), getCanClickLater(), mEarlierButtonp, mLaterButtonp, and LLView::setEnabled(). Referenced by LLGroupMoneyTabEventHandler::LLGroupMoneyTabEventHandler(), LLGroupMoneyTabEventHandler::onClickEarlier(), and LLGroupMoneyTabEventHandler::onClickLater(). Definition at line 815 of file llpanelgrouplandmoney.cpp. Referenced by getCanClickEarlier(), getCanClickLater(), impl(), LLGroupMoneyTabEventHandler::onClickEarlier(), and LLGroupMoneyTabEventHandler::onClickLater(). Definition at line 818 of file llpanelgrouplandmoney.cpp. Referenced by impl(), and updateButtons(). Definition at line 808 of file llpanelgrouplandmoney.cpp. Definition at line 813 of file llpanelgrouplandmoney.cpp. Definition at line 819 of file llpanelgrouplandmoney.cpp. Definition at line 821 of file llpanelgrouplandmoney.cpp. Referenced by impl(), LLGroupMoneyTabEventHandler::onClickEarlier(), and LLGroupMoneyTabEventHandler::onClickLater(). Definition at line 814 of file llpanelgrouplandmoney.cpp. Referenced by getCanClickEarlier(), and impl(). Definition at line 809 of file llpanelgrouplandmoney.cpp. Referenced by impl(), LLGroupMoneyTabEventHandler::LLGroupMoneyTabEventHandler(), and LLGroupMoneyTabEventHandler::~LLGroupMoneyTabEventHandler(). Definition at line 811 of file llpanelgrouplandmoney.cpp. Referenced by impl(), and LLGroupMoneyTabEventHandler::~LLGroupMoneyTabEventHandler(). Definition at line 817 of file llpanelgrouplandmoney.cpp.